What should you do next after setting up Google Analytics? Try to focus on a few things that will help you manage your analytics the right way from the start. 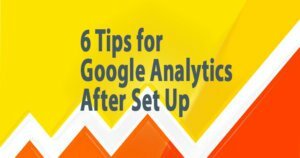 These 6 tips will get you moving in the right direction after Google Analytics setup. Lots of people set up Google Analytics then start make changes to the default View. The default View is called “All Web Site Data”. Making changes without first creating additional Views is a mistake. It’s important to take a moment and create at least 3 Views before making further changes to your account. Create these Views: “Master View”, “Raw Data View’ and “Test View”. Under VIEW click View Settings. In View Name change to “Master – example.com” and Save. Click Copy View. Then change New View Name to “Raw Data – example.com” and click Copy View. Follow the same steps and create a View “Test – example.com”. Go back to by clicking Admin then look at VIEW. Now you have 3 Views in the drop down menu. Be sure to leave the Raw Data unchanged. BENEFITS: For Google Analytics to be useful for your specific website, you need to make some configuration changes. You can make copies of the Raw View, to create new Views. But always leave one Raw View untouched that will always show all the data Google collects. You don’t want to track Visits to your website unless the User is a customer or prospect. Create an Internal IP Address filter so don’t include employee Visits to your own website. BENEFITS: Your data will keep getting skewed whenever someone in your office visits your website. So without an Internal IP Filter, you will keep analyzing your Google Analytics with additional false Visits to your website. Search Console was previously named Webmaster Tools. It will help you uncover valuable website information. You will need to manually connect Search Console with your Google Analytics account before accessing it. *You won’t see much until you have data. Set calendar reminders to view Search Console in a week and then again in a month. Landing Pages – Ranks Landing Pages on your website by performance. Use this report to evaluate content on your website like the blog posts with the most traffic. Queries – See search term rank, click, impressions and more. This is a good way to begin understanding your organic search on Google. Links to Your Site – View the number of backlinks to your website. Analyze “Who links the most” and “Your most linked content’. Click each web page link to view the specific websites linking to you. Index Status – View total number of web pages that have been indexed by Google. Check Crawl – View crawl errors examine number of 404 & other errors. BENEFITS: Additional reports in your menu under Search Console in your Google Analytics account. Plus, additional features on the Search Console website. You can access great information about: web content, organic search, SEO and health of your website. Bots and Spiders running automated tasks on the Internet are likely to hit your website. Unfortunately, this non-human traffic will skew your data. There are more advanced ways to avoid bots. But here are two simple ways to start. b. Create a filter that includes United States traffic only. This will help you avoid most of the bot spam. If you want other traffic, just include those countries as well. For example to add Canada, Mexico, United Kingdom traffic enter: “United States|Canada|United Kingdom|Mexico”. BENEFITS: Bots and Spiders are a source of bad data. If they hit your website, you don’t want these false Visits in your Google Analytics. Utilizing filters can increase data quality which improves your analytics. Reports are the core reason you set up Google Analytics. Reports provide useful information needed to improve your website and Digital Marketing. Here’s three fundamental reports to get you started. Source/Medium Report: Learn about the origin of your website traffic. For example, see how much traffic you get from Google/Organic. Landing Page Report: Compare the pages where Users land first. For example, see the content that drives the most traffic to your website. Behavior Flow Report: Learn about User Experience and how Users move through your website. For example, see where Users are leaving your website most often. It’s easy to automatically schedule emails to yourself with a weekly or monthly version of each report. Emailing Reports to yourself reminds you to analyze reports on a regular basis. And this is how you discover value insights about your website. Plus, it’s a smart way to automate a key part of your Digital Marketing management. Gaining momentum after set up with these tips is great. Now that you’re moving in the right direction get ready to set up Goals. Utilizing Goals is critical. It will enable you to measure what’s important to your business. The next Google Analytics blog post will cover tips for Goals.